Guilin was BEAUTIFUL. We got to see the China that you see in pictures. 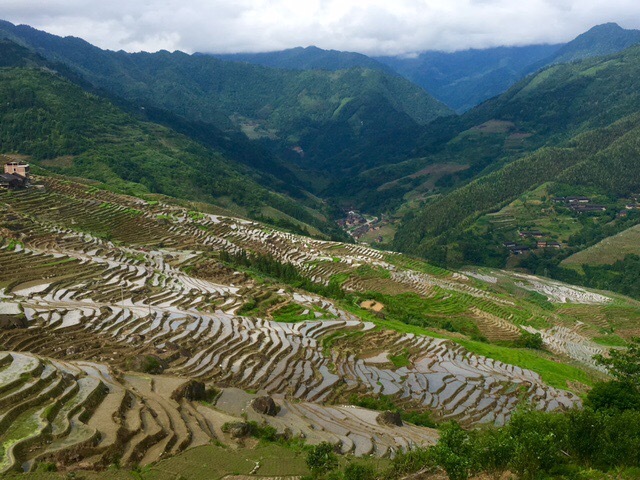 In fact, 95% of the photos you see of Chinese rice terraces are taken where we were in Longsheng. We had quite the hike through the paddies and up the mountain! We then had lunch with a local family. Every thing on our table was sourced from their farm. In fact, the chicken for the soup was running around the front door just minutes before it found itself in our pot. Even our greens were harvested from the local mountain. Talk about farm to table! Our drive from the city to the terraces took a bit longer than expected due to a BAD accident, which unfortunately is not uncommon on the twisting mountain roads. It was quite an adventure! We were stranded for a little more than an hour, along with every other car and truck, as we waited for the roads to clear. Luckily, we were out of the way of the rock slides; a few other cars weren’t so lucky. We got the chance to chat with other people on our same predicament, eat some local snacks, and just hang out and enjoy the scenery. 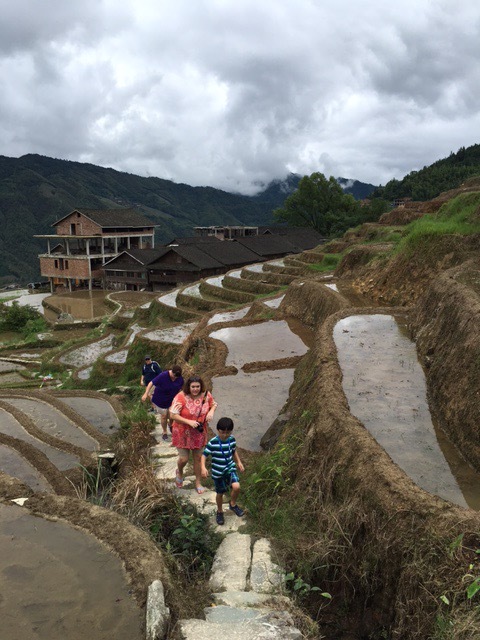 The Longji terraces have been there since the Yuan Dynasty (more than 600 years). The same families have lived in the village for generations, and it’s completely obvious. They sure know what they’re doing! Jack had a BLAST picking his way through the terraces, and especially racing up the mountain. Me? Not so much with the racing, but I made it to the top, so that’s something!